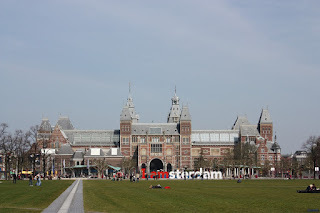 After a short flight and a quick train we arrived in Amsterdam city center at the Amsterdam Centraal railway station. The first thing you notice when you walk out is how many bicycles are at the station. They have special bike parking garages, for lack of a better term. Other than bicycles, trams are the easiest way to get around. There is a metro (subway) system in certain areas of town but it is not best for touring. To start we headed to the flower market to see what is was like on a Saturday morning. As you learn with a little time in the city Tulips are the name of the game in Amsterdam and for that matter, the Netherlands. Some huge percent of the world's tulip bulbs come from the Netherlands. After our dose of calories for the day we made our way over to the Anne Frank House where we found a huge line and decided to pass until the next day instead finding a quiet side canal and street for a bit of photography practice with the new camera. Next we decided to stop and have a traditional Dutch pancake at the famous Pancake Bakery. A quick tip if you are not wanting a full meal you can easily split one pancake for 2 people as we did. First, you choose between savory and sweet. So for us it's easily the sweet variety. Then you choose what you want on it and we opted for apples, cinnamon ice cream, powered sugar and whipped cream. The apples were even baked into the pancake. If that's not sweet enough they even have huge vats of syrup on the table. Here's the final product. To wind up the day we decided on a late evening Red Light District Exposed tour. Eye opening just doesn't express it because you know it exists and have heard about it but to see and hear about the everyday entrepreneurial life of the girls...that was truly fascinating. You start out by learning about how the district came about and how it evolved over the years; you also see the "high end" areas, the coffee shops, shows and stop to take photos in the one allowed area. 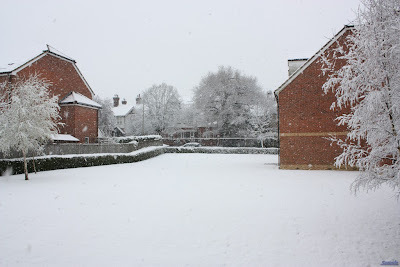 Despite the cold, snowy weather we wanted to go see the torch relay through London. We decided to avoid the hot spots and just catch it at an easy to get to location. When I say hot spots I mean certain places on the torch route that were supposed to have throngs of demonstrators such as Downing Street where the Prime Minister Gordon Brown lives and is scheduled to greet the torch or during the Chinese Ambassador's leg where she would carry it near China Town. We positioned ourselves at Piccadilly Circus mainly because it fit our time frame upon arrival into London and it was right outside the tube stop. After waiting a few minutes, what I am going to call the torch entourage rolled through. Starting with police on motorcycles, then official Olympic Torch Relay vans, then the bus with all of the next runners and officials, more police vehicles and finally a massive group of people. This group included torch bearer who was surrounded by loads of security all passing by us without incident. Ah, the Olympic flame that so embodies what the Olympics are all about. It must be such an honor to carry. The atmosphere was amazing. Drums, cheers, a few peaceful protesters, and a few boos. With so much energy in the air we had to follow the flame. As it passed us the crowd starting moving so we went too. We chased it to Trafalgar Square where there were even bigger celebrations and protests going on. Confetti shooting into the air, flags waving, more drums and more protesters. Luckily from what we could see the protests were still fairly peaceful although we did see one unhappy man being arrested. At this point the torch headed away from Trafalgar in the direction of the south bank and Westminster so we decided to try and get ahead of it again at London Bridge and jumped on the tube. This also avoided some of the above mentioned hot spots. After lunch and a bit of waiting around we watched it pass by at the Mayor of London's office between London Bridge and Tower Bridge. Then we took off for Tower Bridge along with the rest of the crowd to get ahead of it again for one more look. This time we were on the bridge with traffic stopped as it passed by. 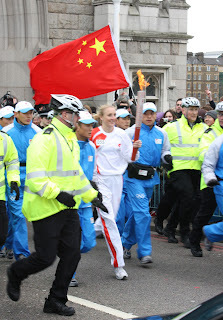 The above picture is of Torch bearer, Paula Radcliffe as she crosses Tower Bridge. So exciting! Regardless of your feelings on China or the situation in Tibet, the Olympic flame and spirit is something that is hard not to get excited about. The weather was a bit cold, but in those moments when a proud torch bearer passed you carrying a simple flame, you really do just kind of stand there in awe.